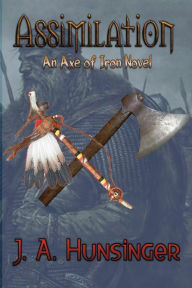 Was thrilled to hear about the release of Assimilation: An Axe of Iron Novel by J. A. Hunsinger. I had the pleasure of editing the first two books in this series, but my schedule didn't allow me to work on this last piece of the trilogy. Assimilation will wet the appetite of the fans that have developed a fascination with the plight of the Greenland Viking settlers in the first two novels of the series, The Settlers and Confrontation. The twists and turns of this continuing tale will engage the reader from the outset as the tall, fair-skinned invaders, knowing it is their key to survival, gradually assimilate with the savage natives of the pre-historical land that will become the Hudson Bay and Great Lakes regions of Canada and the US. In a scenario ordained by the gods, this assimilation process has a thin chance of success through the forced involvement of two of the Viking settlers with tribes of natives that are habitual enemies of one another. Against overwhelming odds that can have but one successful outcome for the settlers, daily life becomes a balancing act where one word, one gesture, one innocent mistake, can spell disaster in this hostile setting.